For about the last year I have been seeing my friends link to recipes and testimonials from Trim Healthy Mama. I didn’t really know anything about it and one day in late July I started looking into it. I joined the Facebook group and ordered the book. The last year of my life has been filled with many ups and downs and much sorrow. I was ready for something positive in my life. I began reading the book and trying to implement some of the things I was reading. Then we got a call we all dread and found out Gene’s step-father was dying. While on that trip Gene’s brother was testing out his new glucometer and one morning we all decided to get our blood sugar tested. This was a big wake-up call for me because my sugar level wasn’t terrible, but it was higher than I would have liked. If you know me well, you know that I usually have a Dr. Pepper in my hand. Even after the high sugar level it took me a few weeks to get off of Dr. Pepper completely. At this point I haven’t had a soft-drink (with HFC) since the beginning of October. I actually don’t desire them any more. The only type of soft drink I have had is Vitamin Water Zero and an occasional Izze (made with fruit juice, no added sugar). I did cheat last weekend and have a drink like an Izze that had added cane juice in it, and I am still paying for that with major joint pain. So far I have lost about 10 pounds, but I haven’t been anywhere close to faithful with the diet except on the soda front. I see now after my sugar binge this weekend that it really does play a major role in my Lyme and joint pain. I am going to be much more careful from here out. I also have some adrenal fatigue issues which may cause my loss to be slower as I heal my adrenals. Many people think that everyone who is over-weight is obsessed with food. I even had a “friend” talk to me about it one time. She was trim but was obsessed with food and assumed my weight issues were related to my food obsession. I actually have the opposite problem. . . I could care less. It is not unusual for me to be up for 4 or 5 (or more) hours before I take my first bite of food. Often I would hardly eat all day and I rarely if ever felt hunger pains. I was just never hungry. This causes your metabolism to shut down and it stores fat instead of burning it. I now have to reverse this process through the way I eat and supplements. If I were to go to a restaurant to eat, I might be able to finish 1/2 of what they served as an entree. The biggest struggle for me is to eat. What will happen often is I forget to eat and then realize it has been over 4 hours and I panic and eat just anything because I know I need to eat. I am working on planning ahead more and having friendly foods ready and easily accessible so that I don’t blow it when I need to eat. We do have sweets on this plan, just not with sugar. We use stevia, erythritol and xylitol to sweeten with. I will be sharing recipes that I have made and use that incorporate these sweeteners. I will also post some recipes that have sugar in them because Sarah cannot use these due to health issues. In THM (Trim Healthy Mama) meals are classified as: S= satisfying (these are higher in fat/low in carb) E= energizing (Low in fat/ higher in carb) and FP= fuel pull (these are both low in fat and carbs and burn the most fat). My recipes will be labeled to denote which category they fall into. This recipe came about last night when Rachel offered me a snack that she had made. I think she called it cheesecake. When I tasted it I found it to be very rich, which isn’t a bad thing but I wanted to eat it with something else. 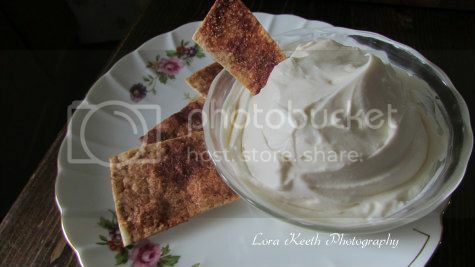 I remembered about Gwen’s Low Carb Cinnamon Dippers. After baking these I sat down for my snack. Gene asked me what I had. I told him and gave him a taste. He loved it as well and asked me more than once if this was really on plan. When I asked Rachel how she made this she said she added some of this and a dash of that. I made some today and got the measurements so I could share it with you. I hope you like and enjoy it. Let me know if you try it and if you do anything else with it. A wonderfully satisfying sugar free cheesecake dip that makes you feel like you're cheating. Put all ingredients into a bowl and mix until combined. This is a super simple and adaptable recipe. I was thinking about the ways to adapt it and I will play with some other ideas and post them as we make them. I hope you enjoy the recipe and will let me know what you think of it. What ideas do you have as to how to adapt it? If you have any questions about THM, please feel free to ask.